Each month you send a rent check to your landlord. Meanwhile, every homeowner you know insists that you're wasting that money. They say that you should buy a home and that owning is a smarter financial move. But are they right? Not necessarily. There are good reasons to buy a home: You get a place to call your own and raise your family. You get more space. You'll gain more — but not complete — control over your monthly housing payments. This doesn't mean, though, that owning is always the better financial choice. In fact, there are many myths about homeownership that could persuade you to buy for the wrong reasons. Here are four of them. It might seem that purchasing a home, holding onto it for years, and then selling it for a profit is a great reason to buy. But the truth is, homes aren't good investments for most owners. Robert Shiller, a Yale economist, has long studied the housing industry, and ranks as a true expert when it comes to real estate and economics. Speaking to The Motley Fool in 2014, Shiller unveiled the numbers proving that housing historically has not been a good investment. Shiller found that from 1890 through 2012, home prices when adjusted for inflation did not grow one cent. Homeowners would have made significantly more money by investing in the stock market during this same time. Shiller reported that the value of the S&P 500 increased more than 2,000 times from 1890 through 2012. Shiller also found that from 1890 through 1980, the real value of home prices actually fell by about 10 percent. Advocates of homeownership often tell you that you're throwing away your money every time you pay a rent check. 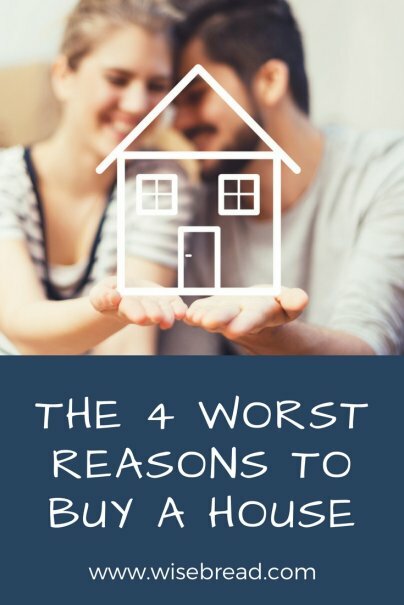 What they don't say is that this doesn't change much after you buy a house — at least not initially. Most of us take out a mortgage loan to finance the purchase of a house. The bank behind your mortgage will technically own most of your house after you close on it. And in the earlier years of owning a home, the vast majority of the money you send toward the bank goes toward paying off interest. Only a small amount of each monthly payment goes toward paying down the principal of your balance. You earn equity in two ways: First, every time you make a payment, you are reducing your mortgage amount. Second, if your home increases in value, your equity will grow automatically. You can't control whether the value of your home falls or rises. Millions of homeowners discovered this in 2007 and 2008, when home values across the country plummeted. Many of the owners who bought in 2005 and 2006 still owe more on their mortgages than what their homes are worth. Building equity isn't a guarantee. Advocates of buying a home point to the deductions that owners can take come tax time: Owners can deduct the interest they pay on their mortgages, as well as their property taxes. But these deductions are becoming less valuable to some people. First, the new tax reform law says that owners will only be able to deduct the interest on their mortgage loans up to $750,000, rather than the $1 million that it was previously. Federal tax reform will also limit the amount that taxpayers can deduct in state and local property and income taxes on their federal returns to a maximum of $10,000. The biggest change, though, might be the new standard deduction. Taxpayers filing their federal returns can either itemize their deductions or take the standard deduction. Tax reform will boost the standard deduction from $6,350 to $12,000 for individuals. It will increase the standard deduction for couples filing jointly from $12,700 to $24,000. There is no financial reason for taxpayers to itemize their deductions if they aren't greater than the standard deduction. As the standard deduction increases, a greater number of taxpayers will take it instead of itemizing. This means we'll see fewer homeowners taking advantage of the property tax and mortgage interest deductions.